Christ the Redeemer is magnificent, at the very top of the Corcovado. 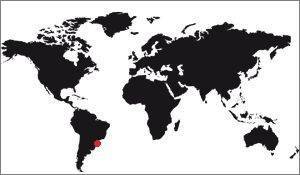 His geographical position is a very nice asset for him, but to visit it, it is naturally said that it must be complex. But no, the prefecture of Rio has set up means of locomotion quite practical, with notable improvements in recent years. 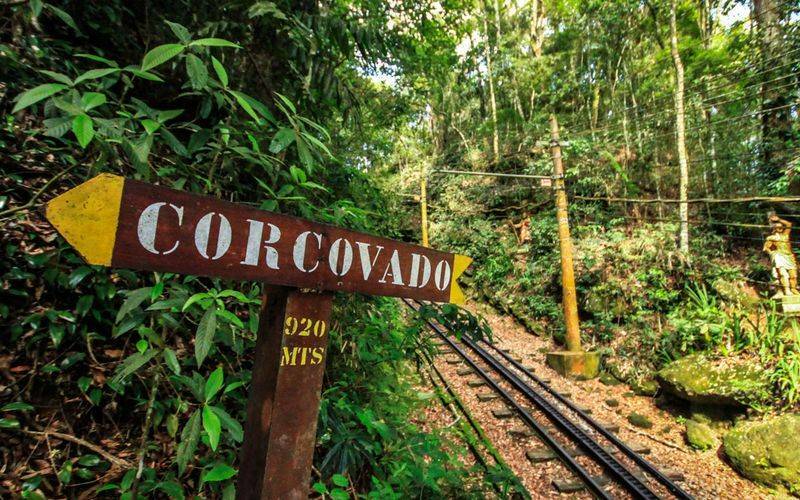 There are three ways to get on the Corcovado: By train, by bus or on foot. The rates differ, depending on the means chosen to go there. It is our preferred means of transportation. 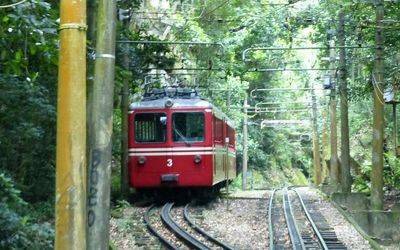 It leaves from the station of Cosme Velho, down the mountain, and leaves you at the top. It is the most picturesque means of transport, it crosses the national park of Tijuca and if you put yourself on the right side of the train, you will have a superb view on the park, its forest, and sometimes on the city. The journey takes 20 minutes, and there is a train every half hour. They are characteristic, bright red, and are in fact cogwheel. 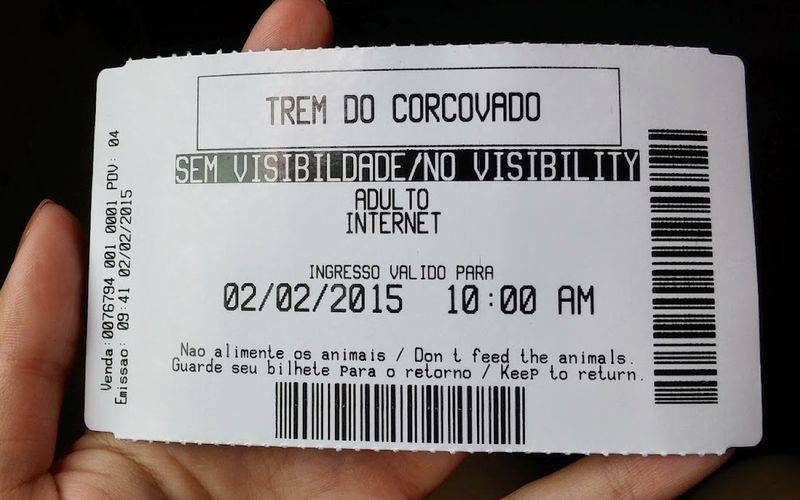 Note that since 1 July 2016 it is impossible to buy a ticket for the same day, you will have to plan your visit date. This is due to the great popularity of the monument, as the train makes a half-hour round trip and can only take a limited number of passengers, sometimes the queues are very long long, far too long. Sometimes, in the early hours of the morning, the visitors were told that there would be a place for them only at the end of the afternoon. The State of Sao Paulo has managed to improve this by imposing to organize its departure to make the traffic of the visitors fluidity, which is probably a lesser evil. To get to the Cosme Velho railway station, it is best to take the bus depending on where you are in the city, it will take you down in front of the church in the neighborhood opposite the train station. Can not miss it. Otherwise you can go by taxi or even by metro, but the nearest metro station is still 3 kms from Cosme Velho, which still makes a great walk, especially before going up to Christ. To the bus, from Praça XV, Zona Sul direction, take one of the following buses: 422, 498 or 180. Get off at São Judas Tadeu Church. From Ipanema, take the bus 570, 583 or 584. From Copacabana, there will be the bus 583. 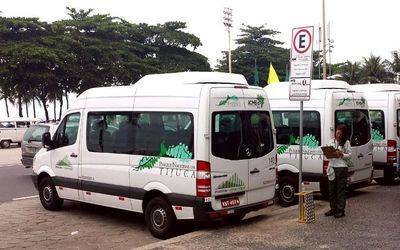 From the Novo Rio bus station take the 126 (Rodoviária x Laranjeiras), get off at the Fluminense Sports Club. 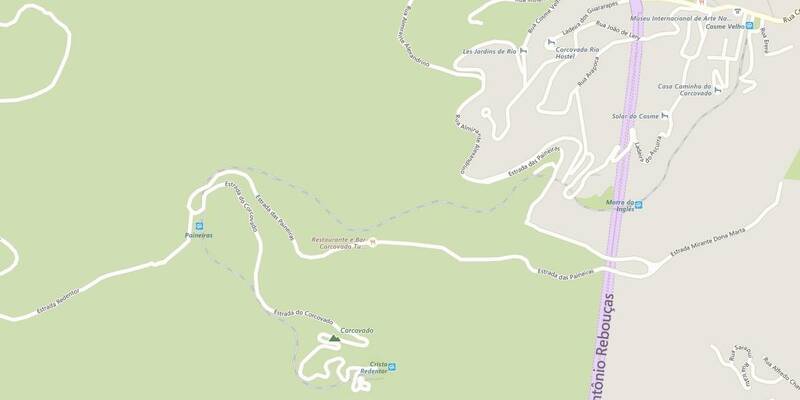 Go back on foot to Laranjeiras Street and take one of the following lines: 422, 498, 497, 180, 584, 583. Now that you are in the train station waiting for the train, take a minute to learn that the train you are going to take advances to 15Km / h up and 12Km / h downhill (and yes!). It weighs 36.8 tons, locomotive and wagons), and it carries an average of 345 passengers per hour. The journey takes 20 minutes. 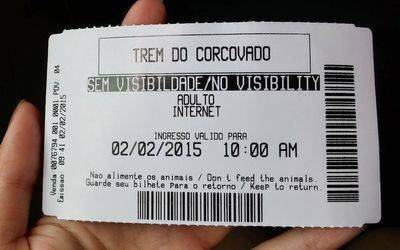 In addition, the Corcovado train website gives you a list of prohibited behaviors, which reads that it is forbidden to feed animals, hunt, carry a firearm or a blunt object, tearing plants, destroying the cultural heritage, listening to music too loudly, being half naked, and even taking a bath in the toilet. You are warned. Buses are in fact a shuttle system set up by the prefecture of Rio. They are white with a green and blue logo representing the Corcovado (stylized) and are waiting for tourists on the metro Largo do Machado, Copacabana or Paineiras. 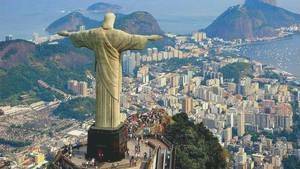 And why not go and see Christ the Redeemer of Rio on foot? It's not just a far-fetched idea, but many people experience it every day. 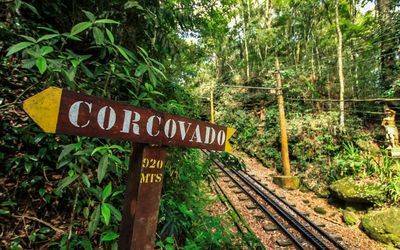 This is of course not the same way to approach the visit, on foot, you will put much more time, but you will cross the forest of TijucaTijuca in the heart. And to arrive at the monument after a good hour of hiking, it is quite different from visiting it in a classic way. You have to start by equipping yourself. The hike is quite easy, but it is long, so you have to have a certain habit of walking. Put on good walking shoes, and take bottles of water, some provisions and according to the weather, a waterproof clothing. The starting point and at Lage Park, the point of convergence of many buses. At the bottom right there is a small hut that marks the beginning of the trail. 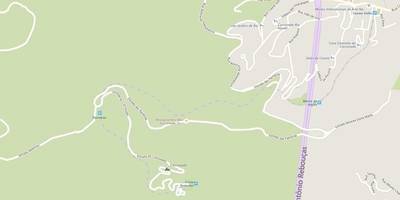 It is indicated that the hike lasts 1h10, but according to your habit and your capacity, count more (or less ...) Know that the hike is almost only climb, often very steep, in a dense forest. The panorama opens regularly over the city and it is an absolutely magical moment. The first part of the hike is simple, it lasts until you pass the three waterfalls. The second part is much rougher, but it is rather short, so do not panic. By walking slowly, even the less accustomed go up without problem. You then arrive on the road that goes up to the top, and this is the least interesting part since you share the asphalt with the rest of the tourists. This is how you get to the monument. Of course passing by, you will only pay the right of access to the monument, not the transport: it is R $ 22,00 in high season, and R $ 18,00 in low season. Where there is tourim, there are services! No difficulty to find, on the spot, what to eat, to drink, or to relieve a pressing need. Everything is organized, and even if the place is rather cramped the flood of tourists is perfectly channeled and allows to see relatively well the monument. Rio-de-Janeiro is pleasant all year round. Being in the southern hemisphere, it is the summer from November to April, a very warm period that the Europeans love because it makes a frank warmth that is opposed to the cold of our winters. But the winter in Rio is interesting as it is still less warm, while still pleasant. From June to September, the average temperature is still 29 ° whereas in summer, it climbs without problems at 35 °, a temperature that can be difficult to bear. So you can say that Rio is a pleasant city throughout the year and there is no season to prefer, just know if you are looking for high temperatures or a more affordable heat. As far as precipitation is concerned, they are rare from May to October, whereas the rest of the year is more abundant. Here is a small table of the minimum and maximum average temperatures in Rio, as well as the height of the precipitation. A little amusing remark about Rio. Most of the apartments do not have central heating, and it is not for economy but because it is useless to heat the habitats in Rio! The best time of the day to visit the Corcovado is undoubtedly morning, early, and for two reasons. First of all because there are naturally fewer people and therefore it is more pleasant, then because from 11am, often a haze rises on Rio, it limits the view when it does not block it, quite simply. The weather is changing in Rio, it is an oceanic climate. When the clouds approach, no need to climb to the Corcovado, you will inevitably be above the clouds, and so the view will be clogged! It is for that reason that one should not proscribe any climb on the spot on a day that is not sunny (There are not many, there), but it becomes difficult to do because now, if we want to climb by train (the most friendly way), you have to buy your seats in advance for a day whose weather is still unknown! Otherwise the evening is also a good time as the city lights up. It does the same thing when you visit the Eiffel Tower in Paris in the evening or the skyline of New York on a beautiful summer evening. Finally there is not enough to discover to Christ the Redeemer. 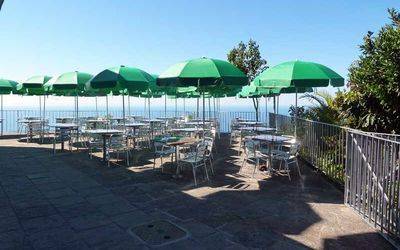 It is not disappointing but the main activity is to admire the breathtaking view that one has of the platform overlooking the bay of Rio. There are even a few other things to be seen, such as the busts of the two principal authors of the statue, the explanatory panels, the train ride, the chapel under the statue, and especially the statue itself, much more impressive than by far. Learn more about what to see on the monument's site. 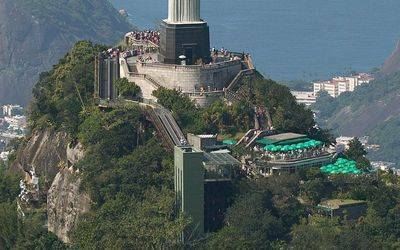 Before the redeeming Christ was built the Corcovado was nothing but a mountain dominating the city. The presence of the tourist train (the first one in Brazil) and the road allowed the construction of a nice glass kiosk nicknamed Chapéu do Sol (Sun hat) due to its shape reminiscent of a canoe boat. There are many reproductions of this kiosk which was the only installation of the mount for a long time. The Cariocas went there on a stroll on Sunday to admire the superb panorama that one has from up there. 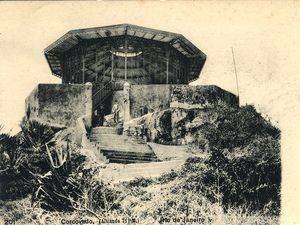 This structure remained after the construction of Christ for 9 years, it was dismantled in 1940.